Li1s peak has very low sensitivity. Use large number (50) of scans when acquiring Li1s spectrum. There are no lithium secondary peaks to assist in confirmation. Difficult to confidently assign Li1s peak for low concentrations. In case of overlap with other elements, peak fitting will be required. 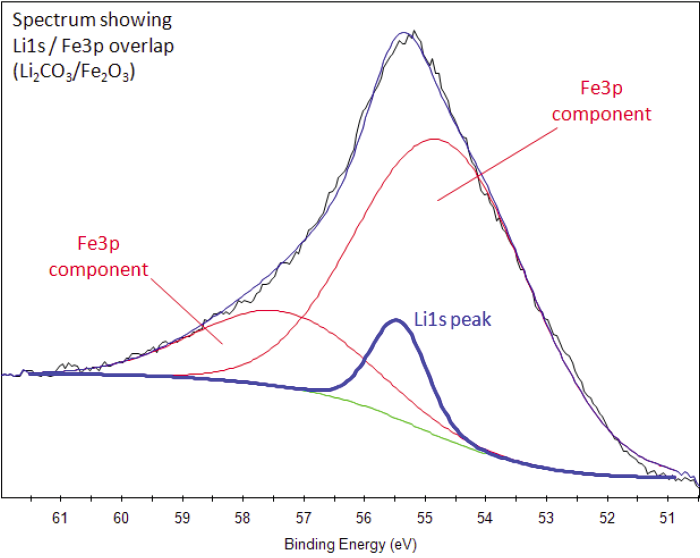 In the example shown below, the Fe3p components have been empirically fitted. (They do not represent a theoretically rigorous treatment of the Fe3p peak shape). Johann Arfvedson discovered lithium in 1817 in a petalite ore found in Sweden. However, the highly reactive nature of lithium prevented its isolation until W.T. Brande and H. Davy used electrolysis on lithium oxide. 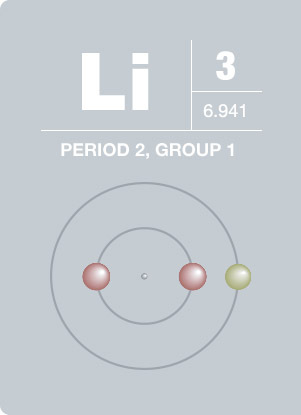 Lithium is not found freely in nature because of its reactive nature. It is the lightest metal with a density about half that of water. Lithium is characterized by a bright red color when heated. The high electro-chemical potential of lithium makes it an important material in storage batteries. Some lithium alloys are used to make high performance aircraft parts, and a number of lithium salts are used as mood stabilizers in the treatment of bipolar disorder and depression.